There is a moment in every marriage where doubt starts to creep in. "How could he do that? Does he even really love me?" "He wouldn't have done that if he loved me!" Before you drive yourself into a self crazed whirlwind, remind yourself of these 10 things. Then check to see if your husband knows you love him. Recognize the little acts of service your husband does for your daily. I overlooked this one for so long, always taking for granted the small things my husband does for me. My favorite act of service: He fills up my water cup and I drink a lot of water. He somehow knows when it's empty and quickly fills it up for me with the perfect amount of ice to water ratio. It's absolutely wonderful and so is he. This doesn't mean he listens to you all the time about every little detail although if he does, that's awesome. It does mean that he listens when it matters. When you say to him, "I need you to listen" or "I need to talk to you" he gives you his full undivided attention. And when you say, "I don't want you to solve my problem, I just want you to listen;" he tries his hardest not to give a solution and become a listening ear. Need more eggs? Forgot to grab the veggie for dinner? Someone spill all the milk? Your husband willingly goes to the store after a long day of work when all he wants to do is come home but does it anyway because you asked him. He may not get the exact brand you wanted or has to call you to remind him of exactly what you were looking for, but he does it and that's the important part. Or doesn't ask you to share yours. You know there are some things that you just don't want to share like a favorite brownie or ice cream. Even when you know it's his absolute favorite food, your husband shares with you. You may have extremely different tastes in movies and shows but he still gives you the remote. Even better, he stays to watch your show because he wants to be with you even if it means sitting through another cheesy Hallmark movie. Whether he is watching a favorite show or playing video games; he turns it off to give you his full undivided attention. That speaks volumes! When he can, he sits next to you. At church, on the couch, or at the movies. The kids may try to wiggle their way in but he wants to sit next to you because he wants to be close to you. He cares about you and wants you to know you come first. Does he insist you go first on the airplane so you can have the window seat? Does he want you to go first when playing games together? If you both start talking at the same time, does he let you go first? One of the funniest things to me when we first got married was that my husband wouldn't touch any of my new things that I got for Christmas even if it was a present that was really meant for the both of us. He wanted me to be the first one to use it. It sounds silly but it's actually a big deal. He's telling you that he trusts you and the way you drive. He's telling you that he is okay with not being in control of everything all the time. You are a team. When you walk next to him even for a minute, he smiles or holds your hand. When you put your feet on his lap, he doesn't mind. When he doesn't have his arms full of kids or things, he holds the door open for you. He gives you a kiss before he leaves. There a million and one small things that he does to show you that he loves you. Are you paying attention? Elder Russell M. Nelson encourages us to nourish our marriages but if we don't believe our husbands love us, we won't have the desire to do so! Watch your husband these next few days and write down all those little things that he does for you. Watch as your eyes open and your appreciation grows for the man you did marry. Then look at all the things you are doing. Are you telling your husband that you love him through your actions? If not, take this 7 day challenge to make sure he knows. Really want to work on your marriage? 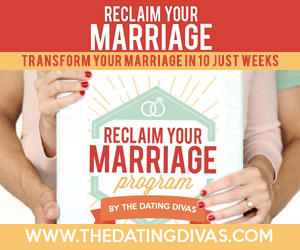 Reclaim Your Marriage is an excellent program that is broken up into 10 week sessions - 1 session per week. Each session hits on a hot-button topic in marriage, like trust, communication, finances, and intimacy. This program is essentially private, at-home couples counseling that you can do all online. Each session includes a therapy video from Tara (founder of The Dating Divas), tons of exercises, activities, thought-provoking questions, and ways to solve those tricky "bumps in the road" that plague marriages today. They have come up with a simple, effective solution that couples can do together, in the privacy of their own home. Your Turn- How do you know if your husband loves you? How does your husband know you love him? This post is part of a blog hop with these fabulous bloggers! We're talking about our marriages, giving tips, and sharing what we've learned but most importantly defending traditional marriage between a man and a woman.